A roll-around kettle dolly on casters can make the job easier. Use a dolly to move a hot kettle from the cooker to the next stage of processing. Or use it as a staging spot for preping a second kettle with ingredients while the first kettle is on the stove. 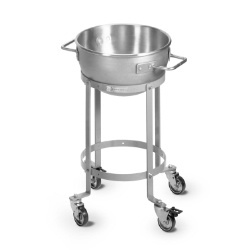 We also have a dolly with convenient Drip-Pan to store the Portable Agitator. The pan will collect any drippings off the agitator scrapers, for easier cleanup. Need to lift and pour? Consider our LifTILTruk kettle lift / bowl lift. One person can safely lift, move and pour hot kettles and mixing bowls. From table top pouring to filling hoppers up to 10 feet high, Savage has a lifting solution.